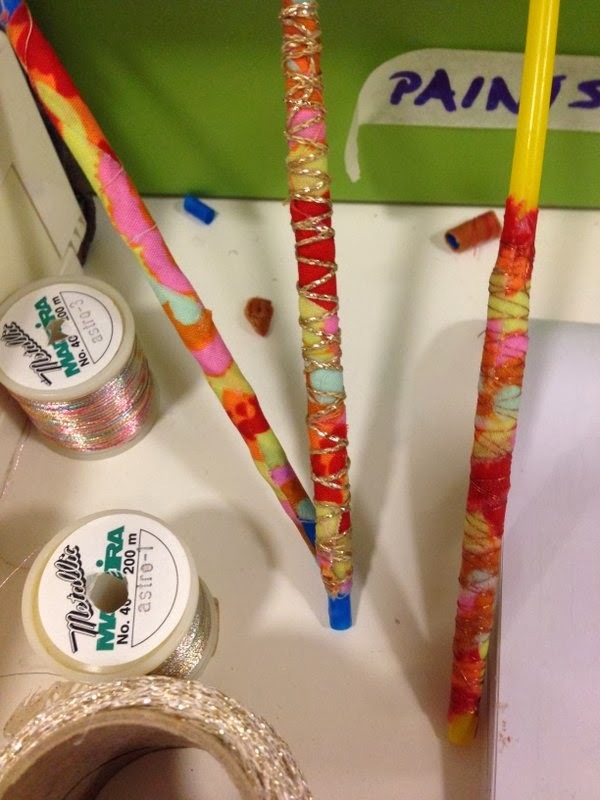 The other weekend at the C&G class we were looking at ways of embellishing your work. As my work is generally unadorned and bling is a definite no-no, this meant lots of research for me. This is one of my favourite parts of teaching C&G – I have a great excuse to go and look up artists and ideas and techniques and learn more myself. 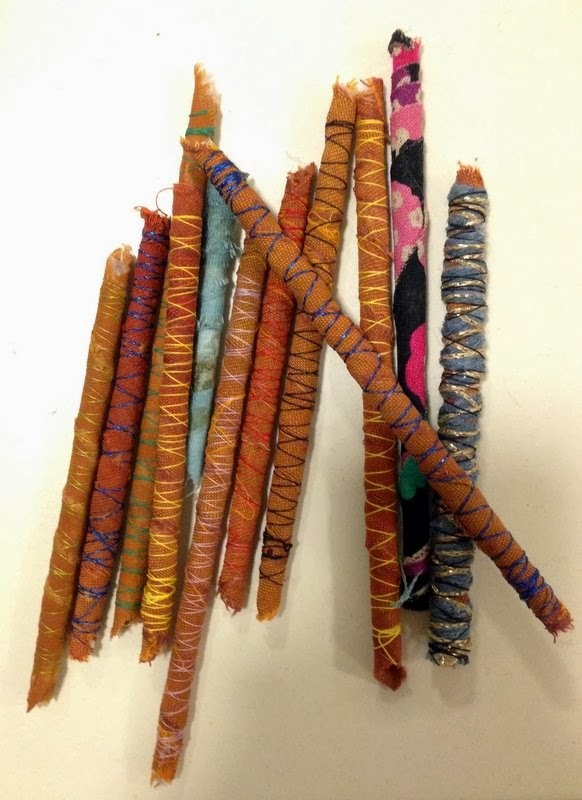 One of the things I came across was making your own beads using straws (an article in a Quilting Arts freebie on embellishment techniques by Gail Ellspermann – you can get it here). 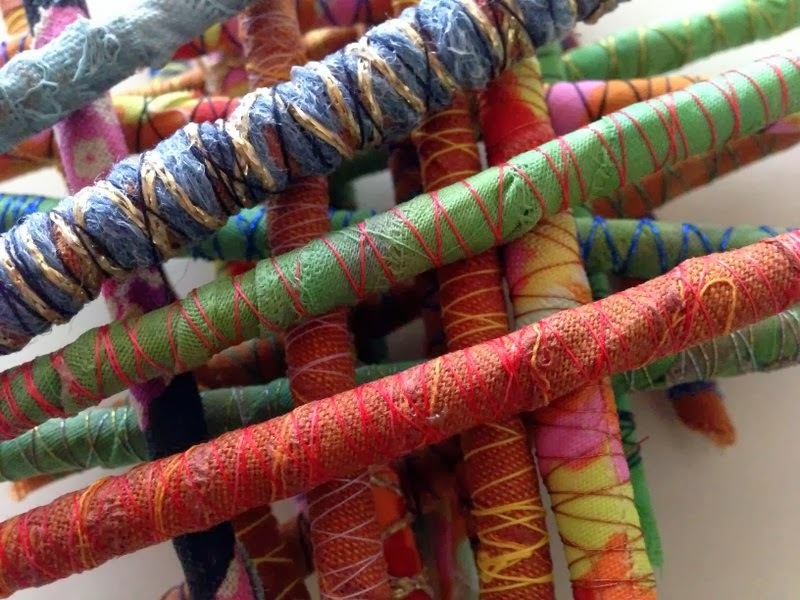 As I was looking quickly for lots of different ideas, all I took away was straws, fabric and glue and looking back at the article now, I’ve made mine in a completely different way. They really are very simple to make, but I did find it quite addictive, making many more than I needed for the class and the artwork I’m going to put them on. 1. 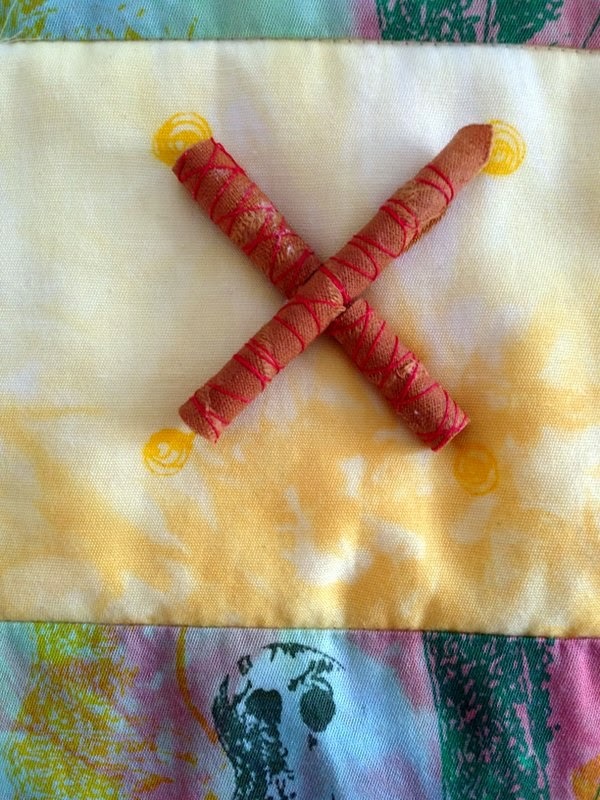 Cover one side of the fabric with pritt stick glue. 2. 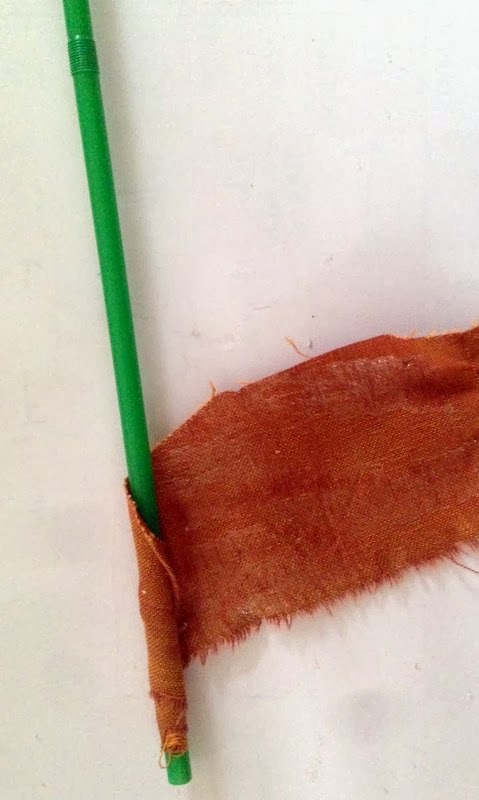 Stick this to the straw (below the bend if using a bendy straw or at least 2in from the end if not) at approx 45 degree angle. 4. 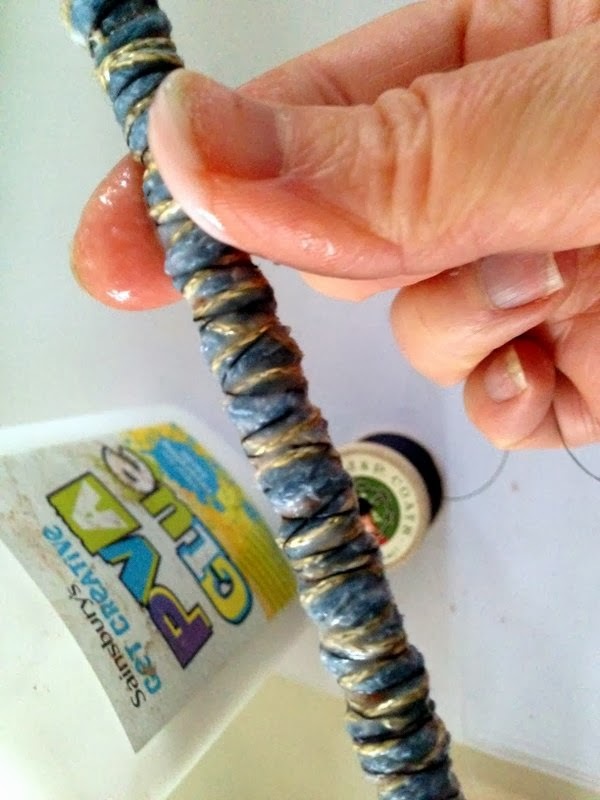 Run a line of PVA glue down the fabric and then wrap the thread(s) you want to use down the straw, rubbing the glue in as you go. Repeat at least twice with the glue, adding more thread if you want. Leave to dry. 5. 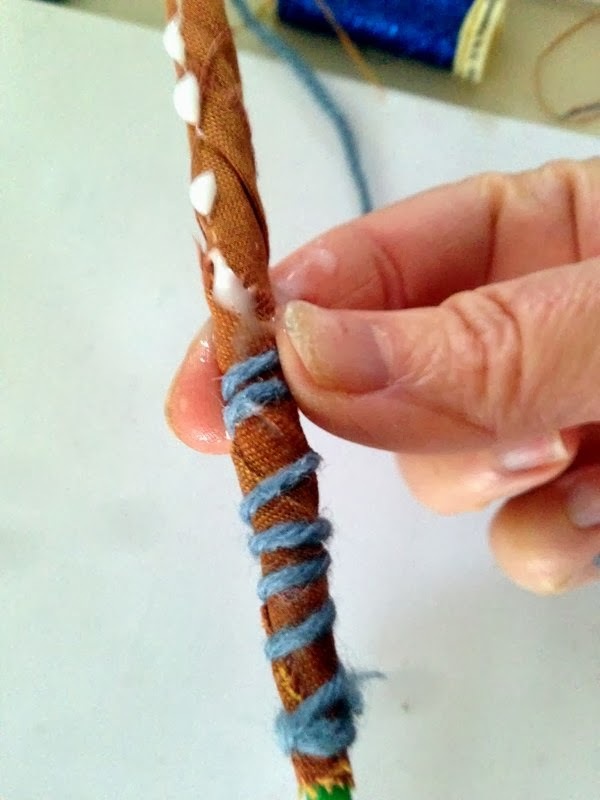 ‘Crack’ the pritt glue by gently squashing the fabric, then pull out the straw. Cut to the desired size using a scalpel knife, and recoat each bead with PVA if need to make firmer or to tidy in ends. As I said really easy! To be contrary, rather than make them in lovely bright colours, I ended up wanting brown beads, although it is amazing how the colour is influenced by even the smallest amount of thread. Have you made anything like these? How have you used them? The C&G class came up with some great ideas for embellishment and we sent them away to make an over-embellished sample. I can’t wait to see the results next month. What a great idea! I'll definitely be trying this!